The range of climatic changes anticipated in the United States – from rising sea levels to stronger and more frequent storms and extreme temperature events – will have real impacts on the natural environment as well as human-made infrastructures and their ability to contribute to economic activity and quality of life. These impacts will vary across regions and sectors of the economy, leaving future governments, the private sector and citizens to face the full spectrum of direct and indirect costs accrued from increasing environmental damage and disruption. 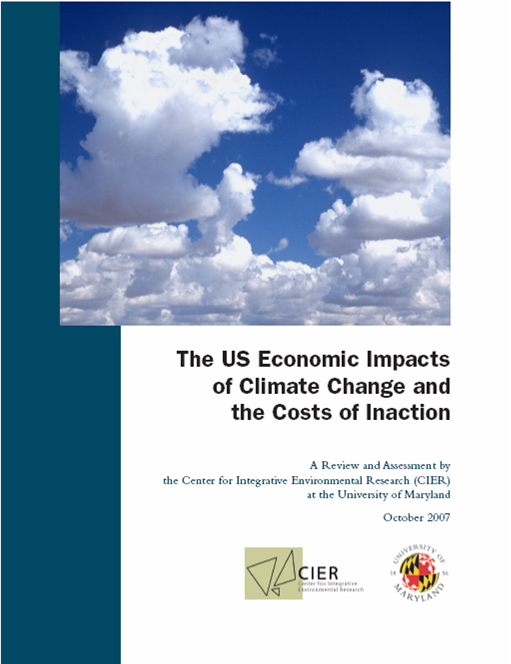 Several studies from CIER look at the economic impacts of climate change: one focuses on all regions of the US , others examine individual states. On a series of state studies, CIER collaborated with the National Conference of State Legislatures (NCSL) which adapted the studies for their members by creating short summary reports from the full CIER studies. In addition, CIER has examined Maryland 's economic impacts from climate change for the State which is Chapter 3 of the Maryland Climate Action Plan. All sectors of the economy will be affected. Essential infrastructures for reliable services and high standards of living and health (such as water supply and water treatment) will be impacted. Ecosystems, on which quality of life relies (such as forests, rivers and lakes), will suffer. This first study presents an overview of climate impacts on various economic sectors in the US, organized by region. Secondary effects of climate impacts can include higher prices, reduced income and job losses. A national policy for immediate action to mitigation emissions coupled with efforts to adapt to unavoidable impacts will significantly reduce the overall costs of continued climate change. Because improved understanding of climate impacts, and the costs and benefits of these impacts, is in the national interest, the federal government should organize and finance a set of region-and sector-specific studies that help guide climate policy and investment, using appropriate methodologies. Support for this research was provided by the Environmental Defense Fund .